I've been on a smoothie kick this last year, trying out all kinds of concoctions made with avocados and sweetened condensed milk (ugh), cucumber and mint (yum), and this one, a super filling combination containing peanut butter, orange juice, strawberries, and (uncooked) oatmeal. It comes from the best smoothie book ever, Delicious Drinks to Sip, Slurp, Gulp, and Guzzle by Rose Dunnington. As the author says, "The other smoothies in this book are great as part of your breakfast, but this one is a meal all by itself. Complex carbohydrates, like those in rolled oats, are good for you, especially early in the day. 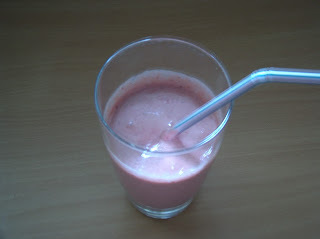 It takes your body a while to break carbs down into usable fuel, so (this smoothie) can keep you full until lunchtime." And at this busy time of year, when you're wrapping, mailing, writing cards, and attending Christmas recitals, it's nice to know that, even when you don't have a spare minute to cook, you still won't starve. Throw it all in the blender and blend away. Note: Pop over to visit Shannon at Rocks in My Dryer for some great Works-for-Me Wednesday tips. Note #2: Check out this carnival at Life as Mom for some more breakfast ideas. Yikes, Megan, 3 a.m.?!! I hope his company pays him well and appreciates his dedication! 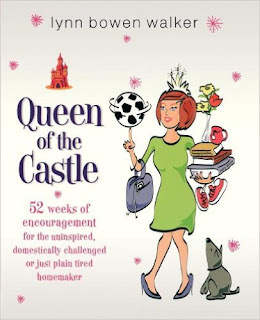 "Uninspired, Domestically Challenged or Just Plain Tired Homemaker" - I love that! Its so totally me! I'm mom to two boys 3 1/2 and 20 mos (developmentally delayed) and I'm tired all the time! I'm going to have to look for your book! Where can I buy one?! Wani, I feel your pain with two boys so close together. Mine are almost 16 months apart and though they're older now, I still remember with piercing clarity how utterly exhausting those first few years were. Hang in there, it will get easier! Much, much easier :) Are they good sleepers, I hope? I am anxious to try your idea! What? A smoothie with Peanut Butter? I'm so there. Glad you are still enjoying the spinach salad - but I know you really just make an extra batch of the maple dressing and pour it into your smoothies ;0) Are you enjoying any of the baseball titles? Gail, I LOVE those pomander balls with cloves stuck in them! I have one I made at least two years ago, still fragrant as ever. Aren't they wonderful? I would be curious to hear what your son learns about the bats - good topic. And I'll have you know that I actually used a recipe recently that required a stove - BIG step for me :0) Of course, our stove ran out of propane so we had to borrow the neighbor's - and technically my hubby was the one to bring them over and pop them in the neighbor's stove, not me, but I am giving myself credit regardless. Enjoy the holidays!!! The Bumbles, congratulations on using the stove! 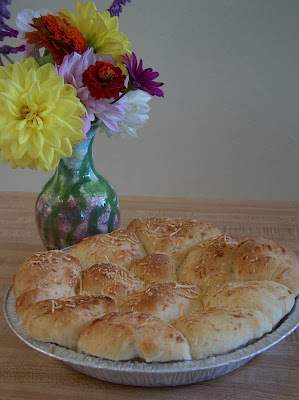 Big step, and the puff pastry recipe on your blog looks delicious. Amy, thanks for reading! If you or your family have any favorite recipes from growing up, I'd love to have them :) Please feel free to share. I hope you're having a great holiday with the family, even if you couldn't make it down to California. We enjoyed three minutes of snow on Christmas day. It was quite exciting. Yummy! I got a blender for Christmas so I could start making smoothies at home. So fun to read new recipes! We also agree with your son's baseball bat research - the Maple bats were the ones flying all over the fields and stands this past year - they turn into shards of dangerous weapons pretty fast. Hi Lynn. Just wanted to tell you that we tried this smoothie over the weekend and didn't enjoy it very much :0( I think the PB in that consistency was not for us. Oh well. I am still in shock that I didn't like something with PB. The Bumbles -- Sorry you didn't like this one. This is one that I've made a lot. Guess everyone's taste buds are different :o Another one I really like has peanut butter, marshmallow cream, and chocolate sauce in it. Not so healthy . . . but I think it's yummy.